← Tongue Piercings – What are the dangers? Your Child’s First Visit — Make it Fun! Visiting the dentist for the first time should be a positive, fun experience for your child. There are some things you can do to help prepare your child for their first visit. Get some books about visiting the dentist and use story time to discuss visiting the dentist. 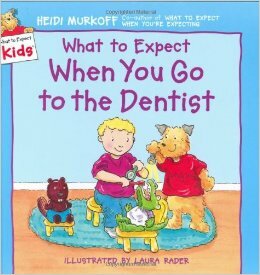 Some children’s books that talk about going to the dentist are: “Just Going to the Dentist” by Mercer Mayer, “What to Expect When You Go to the Dentist” By Heidi Murkoff, and “Going to the Dentist” (Usborne First Experiences Book), and “The Berenstain Bears Visit the Dentist” by Stan & Jan Berenstain. Practice having your child open wide (like a lion), and count their teeth. Use a little mirror if you have one. Let them look at and count your teeth. Play “Dentist” using props like a toothbrush, a flashlight, and cups for rinsing. Have your child lie down and open their mouth like they would in a dental chair. Shine the light in their mouth, count their teeth again. Even use a toothbrush to “polish” their teeth. Once you have played dentist with them, and they have practiced on you, have them pretend to take their favourite stuffed animal to the dentist for a check up! Do this several times over the course of a few weeks prior to their first appointment. Explain what other things the dentist may do during the appointment. Use simple, non-technical language. Don’t try to explain X-rays, instead simply say, “The dentist might take some pictures of your teeth with a special camera”. Prior to booking their first appointment, have them accompany you or an older sibling to a routine dental “check up” appointment. Let them watch how you do it, and then let them have a ride in the chair, and a treat from the treasure box. We are happy to accommodate children in this way, as are most offices. This is a great way to get them familiar with the dental office and the staff. Let your child bring his or her favourite stuffed toy along to their visit. What should I NOT do when preparing my child for their first dental visit? Do not wait for an emergency to take your child to the dentist for the first visit. If you are nervous about going to the dentist, do not express any of your own fears or anxieties. Do not use phrases like “It won’t hurt” or “Don’t be scared”. Comments like these are not soothing and usually only create anxiety. You should take your child to the dentist when they begin to get their teeth – usually around their first birthday. Until they are approximately 3 – 4 years old, the visits will be short and are done to ensure that there is no decay or other problems present. Around the age of 3 – 4, children are usually old enough to sit and have their teeth cleaned, along with a “check-up”. We love seeing children at Sunningdale Dental, and they love coming to see us. Give us a call today to book your child’s first dental visit. This entry was posted in Other Tips, Prevention, Uncategorized and tagged first dental visit, preparing your child for their first dental visit, Your child's first dental visit. Bookmark the permalink.